Viajando oeste em direcao a Montana pasamos por varias cidadezinhas do interior, alias, como ja comentei, preferimos passar por estas rotas alternativas, onde pode se ver coisas inusitadas, como as cidades de Alladin e Hullet. Nesta ultima visitamos a Galeria de Arte do artista Bob Coronado e o Trading Post. Passamos pela "Devil's Tower" - uma pedra de 1267 pes de altura, medindo de 1 a 1,3 milhas de circunferencia e que foi declarada como o primeiro "National Monument" em 1906 pelo Presidente Theodore Roosevelt. Conta a lenda que haviam 7 indiazinhas brincando na redondeza e foram perseguidas por um urso. Para se safarem elas correram e subiram numa pedra tentando se refugiar. Como a pedra era pequena, elas pediram aos Espiritos que as salvassem...A rocha entao se ergueu e o urso ficou a encravar suas garras tentando escalar sua encosta para alcanca-las. As meninas foram salvas e os Espiritos Superiores as transformaram em estrelas - e elas sao as Pleiades. Cenas do filme "Contatos Imediatos do Terceiro Grau" foram feitas aqui. Visitamos o "Little Big Horn Battlefield" - territorio dos Crow - ultima batalha do General Custer e seu batalhao. No Wyoming passamos pela Big Horn National Forest, passando pela Medicine Wheel National Historic Landmark - figura de tradicao das cerimonias indigenas. Pernoitamos na cidade de Cody e no dia seguinte visitamos o "Buffalo Bill Center of the West" - 5 museus em um mesmo local - um deles descrevendo a vida de William Frederick Cody (Buffalo Bill), outro com uma colecao e exposicao de mais de 1.000 armas, e outro sobre a vida das tribos indigenas locais - muito interessante e educativo. Dai seguimos em direcao ao Parque Yellowstone - passando pela "Bill Cody Scenic Byway" costeando o Shoshone River na Shoshone National Forest e acompanhando a cadeia de montanhas "Absaroka Mountains". Pernoitamos no Wapiti Campground, camping meio selvagem, so que se tem agua e eletrecidade, ao lado do rio. Traveling West towards Montana we went by several small and unique towns, by the way, as I stated before, we rather travel these "alternative" paths, like Alladin and Hullett. At the former one we visited the art gallery of artist Bob Coronado and the "Trading Post". We went by the "Devil's tower"a 1.267 feettall stone monument, measuring from 1 to 1.3 miles around and was dedicated as the first National Monument in 1906 by President Theodore Roosevelt. Indian stories go that there were 7 little native indian girls who were playing around that area when they were chased by a bear. 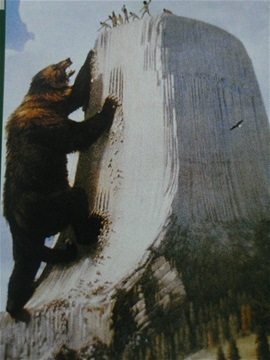 They ran and sought protection climbing on a stone, which was very low and so, they prayed for the Spirits asking for protection and all of a sudden the rock started to rise until the little ones were out of reach by the bear, which started trying to climb up leaving the marks of its claws on the stone. The seven little indian girls were saved and the Superior Spirits tranformed them into stars - the Pleiads. Some scenes of the movie "Close encounters of the third kind" were made in this spot. We visited Little Big Horn Battlefield - Custer's Last stand, and learned a little more about this happening. In Wyoming we travelled by the Big Horn National Forest, passing by "The Medicine Wheel" Historic Landmark - figure of native indian tradition. We stayed overnight at a KOA in the town of Cody and the next day we visited the "Buffalo Bill Center of the West" - a complex of 5 museums in one place. One of them describes the life and accomplishments of William Frederick Cody - Buffalo Bill, another museum shows a collection of more than 1.000 fire arms; and another that tells the stories of the local indian tribes - very interesting. After that we went towards Yellowstone Park going through the "Bill Cody Scenic Byway following the Shoshone River at the Shoshone National Forest, with the Absaroka rand judt by ouir side. We stayed overnight qt Waipiti campground, by the river.